The New Tubby Table is the first and ONLY activity table for the bathtub that keeps water and toys INSIDE the bathtub and not on the bathroom floor. Parents and grandparents love this gift item because it has 3 different play areas for their kids to keep them entertained and focused during bathtime, AND it makes bathtime a calm and more peaceful experience for parents because the play is kept inside the tub. Grandparents often will purchase one Tubby Table for their home and another for their grandchild's home. It's unique, useful, and fun and at the right "gifting" price point of $39.99. 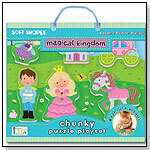 The add-on activity mats + toys also make a perfect second gift for a birthday at only $14.99 each. Specially designed for bathtime play, Corolle's Mon Premier Bébé Bath Baby Doll & Accessories is soft, poseable and so light it floats in water. In this boxed set, the doll comes complete with 8 accessories, including a snorkel mask with two different frames, floaties and flippers, too, for enhanced water play fun. Filled with polystyrene beads that dry quickly, this Bébé Bath Baby Doll will be your child’s favorite playmate out of the tub, too. When bathtime is over, simply air-dry the doll by hanging it from the tab on the back of its neck. Bébé Bath Baby Doll features quality materials and careful attention to detail. Her face and limbs are made of soft, supple vinyl that is delicately scented vanilla -- a Corolle signature, and her blue eyes close when you put her down for a nap or at bedtime, just like a real baby. From waking to sleep, Bébé Bath Baby Doll will be your child's favorite companion. — Elizabeth Royall, buyer of Wonder Works in Charleston, S.C., told TDmonthly in an April 2015 survey that this Pirate Bath Ship was their store's best-selling bath toy. Love me wet, Love me dry SPLUSHY™ characters go from beach to bath to bed! 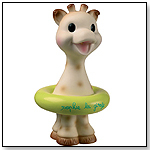 No more need to keep soft toys away from water – kids love to get wet and so do their SPLUSHY friends! Each hand sewn friends, made from the softest most colorful plush fabric, comes with a removable hoodie. Machine washable, anti-microbial filling. Turn water into goo – and back again for unique bath time fun. Gelli Baff® is a completely harmless powder that soaks up to 400 times its own weight in water. Sprinkle Gelli Baff® powder evenly over the surface of bath water and let the goo magically form for about 2 minutes. Stir well, climb in, and have fun. When the fun is done, add the dissolver, and the goo disappears. SoapSox is an adorable deluxe bath aid used to bathe children...and adults! Each character is created using soft terrycloth for the exterior and porous sponge for the interior. 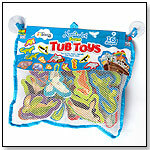 To entertain children during bath time, each SoapSox character has a fun uniquely designed entry for its soap pockets, which can be filled with your favorite liquid or bar soap. "Finger pockets" are conveniently built into each character for better handling and extra scrubbing power. When you begin to scrub using the soap filled SoapSox, suds form and soap is released from our patented SoapSox pocket. While your child is entertained by the characters' vibrant colors, textures and functionality, he or she is also getting clean. Welcome to Wonderland. A beautiful place where children can be themselves. Minilotta will inspire any child with the world of imagination. Everyone needs that special friend and share their dreams and secrets with. Each of these soft plush 30cm dolls is cuddly soft and will make every little person want to give them a snuggle. In case of a bit of extra loving, each Nici Wonderland doll is machine washable. Minilotta can even be taken into the bath. Nici Wonderland dolls are made of high quality materials and follow very strict safety guidelines. Ten cups to stack or nest are great companions to water and sand play. — Patti Tepper-Rasmussen, owner of Learning Tree Toys, Games & Books, Inc. in Oklahoma City, Okla., told TDmonthly in an April 2013 survey that these stacking cups are among her store's best-selling bath toys. Made entirely of child-safe foam, these huggable, squeezable, touchable favorites are designed to get kids learning while playing in the bath. 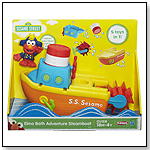 Perfect for bath time, playtime, anytime fun and learning. Fairy-tale fantasies come to life in royal fashion as kids pop out a princess, prince, enchanted castle and more from a beautiful magical kingdom. Launch date: April 2012. 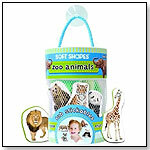 Soft Shapes® Tub Stickables are made entirely of child-safe foam. 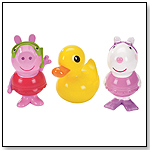 These huggable, squeezable, touchable favorites are designed to get kids learning while playing in the bath. Perfect for bath time, playtime, anytime fun and learning, These fun filled sticker sets contain 20 chunky foam bath stickers that float in water and stick to the tub, packaged in a reusable tote-along tube that suctions to the wall. Other sets include Mermaids, Trucks, and Pirates. Noah and his bubbly aquatic friends (16 pieces) will transform your tub into an enchanting water wonderland - and once your child's adventure has come to a happy end, drying and storage is a breeze with the included suction cup mesh bag. Pieces 3" to 6". Recommended Ages 3+. Launch date: September 2012. Angelcare is proud to introduce the new soft touch bath support. Ergonomically designed for baby’s safety and comfort, the bath support is made of durable plastic that keeps it shape. The soft touch material makes for a comfortable and slip free bathing experience. Hygienic, easy to clean, and quick to dry, the bath supports also have a convenient storage hook. The bath support is recommended for babies aged 0-6 months, and up to a maximum weight of 30lbs. No assembly is required. Launch date: August 2012. — As of 09/13/2012 this product had 4 out of 5 stars from 1 review on Amazon.com. Pros: Stationary (doesn't slip); Supports babies' head; easy to clean and dry. Three fun playbacks "alert" him when it’s time to tip the seat back down. A flashing LED light every 15 seconds lets users know when he’s left the seat up in the middle of the night. Peel-and-stick adhesive backing attaches easily to the flat underside of any toilet seat. Hygienic, water resistant case. 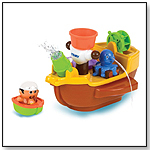 Make bath time more constructive with this innovative play set. Arrange the assortment of twisty, straight, and stair chutes, along with the giant water wheel, to create a unique water cascade. 8-oz. reservoir and scooping cup keeps the flow going until bath time is done. Mix and match pieces mean endless possibilities.